In life, you have always given your family whatever they have wanted. Yet, there are some promises you have to fulfil, such as taking your family for a vacation or buying that dream house. Set aside some money to achieve these specific goals with the help of Reliance Savings & Investment Plans. These plans allow you to experience the joys of life and provide for your family's needs. Enjoy life without worrying about the promises you have made - we are here to fulfil them. We all work towards financial milestones such as buying a house, securing our children's education, going on a dream vacation and living comfortably after retirement. These are critical milestones, achievable with a sound financial plan. 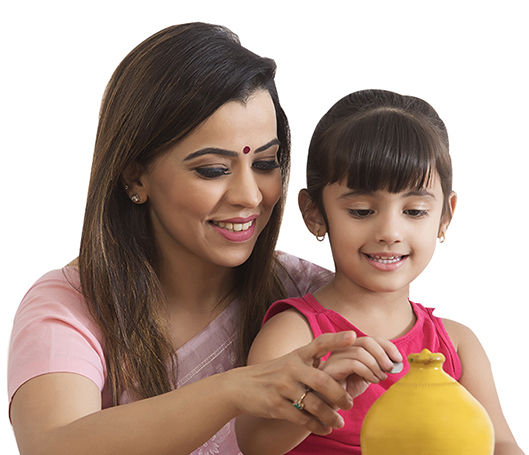 Get guaranteed money back benefits at periodic intervals to fulfil your family’s desires. A plan that secures your future. Accumulate your savings for your financial needs at every stage of life. Get monthly income which increases every year to keep pace with your growing needs. Guaranteed. A money back insurance plan that offers fixed periodic lump sums in the last five years of the policy term. A plan that provides an additional annual income to help you realize your dreams. A plan that provides you with a regular income till 85 years of age, with a life cover to protect your family from unforeseen eventuality. A life insurance plan that gives increasing guaranteed payouts every 3 years to keep pace with your growing lifestyles needs. There’s no better gift for your child than the best start in life. Get guaranteed payouts at periodic intervals to fulfill your family's desires. A plan that gives you increasing payouts, and takes care of your business and your family. A plan that helps you achieve your goals sooner. A plan that helps you create a corpus through systematic savings, so that you can fulfill your family’s desires. A plan that gives you the ability to enjoy your passions even after retirement.